Having an Alarm Auto Dialer attached to your buildings Fire Alarm today should be considered essential not only your peace of mind but a lot of insurance companies now require it. A fire alarm without an Autodialer is a bit like the proverbial tree in the woods, if you have spend thousands of pounds getting the latest fire alarm installed with smoke and heat detectors dotted around and it is triggered at 0200 in the morning and no one hears it then it was a waste of money when you arrive in the morning and find the buildings no longer there. Even if you have a 24hr manned site with a security office you want them dealing with the fire and making sure the building has been evacuated not trying to find the emergency contact list. Most types of Autodialer supplied today are not up to the task, they are designed as cheap add-ons for residential intruder systems where if they fail and don’t dial out it’s not the end of the world. But if there’s a fire and people’s lives or your business is at stake then you need a reliable peace of equipment that is designed for the job. Industrial/commercially designed with quality internal components (not built as quickly and cheaply as possible using the cheapest parts around). Multiple channels/inputs that allow the distinction of different areas/zones of the building. 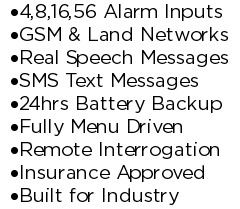 Customisable messages that meet the specification laid down to dial 999. Being able to program in multiple alarm message recipients. Knowing that the machine will keep trying to send alarm messages until the alarm has been acknowledged. Be fully serviceable (6 or 12 monthly) by the manufacturer or by a Service Company fully trained by the manufacture. IP65 Enclosure to protect from moisture / dust and insects causing damage. Channel to Roster – With this feature installed each channel is in practice a separate machine, which will dial a totally separate set of alarm numbers. So for example if channel 1 was activated it would phone telephone list 1, if channel 2 was activated is would phone telephone list 2 etc. This is ideal for a block of businesses where you want to communicate the detection of an alarm to the building owners and the individual businesses with out disturbing everyone else or buying multiple Autodialers. Telephone line Backup – if the Land line fails e.g. a provider fault or the fire has taken out the line, the M30 will automatically switch to the GSM mobile/cell networks. SMS Text Message – The M30 can now send SMS text messages as well as Speech messages to each recipient. For more information check out the SMS Autodialer Page. The M30 and its predecessors have been used around the world for the protection of People, Assets, Property and livestock since 1956. For more information how the M30 can connect to your fire alarm and the current Pricing please Contact Us or visit the Autodialer Features or Autodialer Options Page.